Game show theme songs don’t usually have lyrics, because anything more than a bed of upbeat jingle-jangles would interfere with the announcer telling us about the fabulous prizes up for grabs that day. 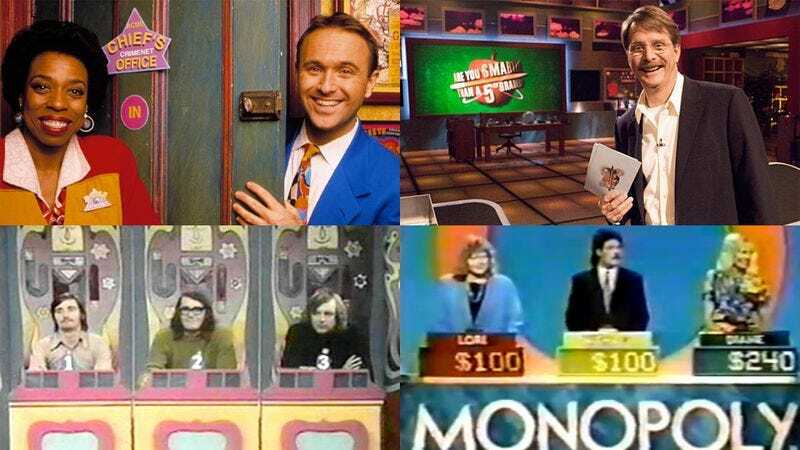 Still, a handful of game shows have defied the trend by adding words to their opening tunes, often with bizarre results. Take the 1970s version of To Tell The Truth, which at first seems to greet viewers with a cheery morsel of sunshine pop. But listen closely to the words and you’ll hear the story of an obsessive suitor who’s fed up with the polite refusals offered by his would-be paramour. Addressing his apparent object of affection, the singer complains, “You don’t know how to tell the truth” and adds that he’s “blowin’ my cool with you right now.” The song only gets creepier as the bitter vocalist recaps the excuses he’s heard from a woman who’s clearly trying to let him down easy: “You say you went home early last night / The book you read found a smile / And that’s why you took the phone off the hook / And never did get my call.” Why would the producers of Truth commission a theme sung by a borderline stalker who can’t take a hint? For that matter, why is this Inventory accompanied by videos of this writer singing the theme songs under discussion? Even in the game show realm, not every question has an answer. Rockapella is to Where In The World Is Carmen Sandiego? as The Rembrandts are to Friends: They’re both musical groups who would be virtually unknown if they hadn’t performed the theme song for a beloved 1990s TV show. But while Ross, Rachel, and the gang never name-checked the Rembrandts on the air, Rockapella got marquee treatment on Where In The World, as every game concluded with the audience shouting, “Do it, Rockapella!” The group would then launch into its catchy tune, which recounts the nefarious adventures of the title villain. The theme invites nerdy kids to memorize fun lines like “She’s a sticky-fingered filcher from Berlin down to Belize,” and its exuberance helped bring the energy back after yet another hapless kid fell victim to Where In The World’s notoriously difficult bonus round. The producers of this single-season ABC primetime game faced a problem: How would they make the title of the show stick in people’s minds? Sure, Monopoly was based on one of the most popular board games of all time, but apparently series creator Merv Griffin didn’t think that would be enough of a hook. So he gave Monopoly a theme befitting Monopoly, a Monopoly-centric ditty that repeats “Monopoly” and spells “Monopoly” (M-O-N-O-P-O-L-Y) until the word “Monopoly” loses all meaning. Alas, this musical brand management couldn’t save the show, whose clunky play and lifeless host (Mike Reilly, an unknown whom Griffin envisioned as his next Pat Sajak) helped ensure that Monopoly didn’t last beyond its initial 12-week summertime run. This Millionaire-meets-precocious-kids format visited a number of low-grade evils on the public, among them Jeff Foxworthy: Game Show Host. Another transgression was the cutesy theme song, which explains the premise of a show whose title already explains its premise. Prepubescent vocalists, backed by an orchestral arrangement that sounds as if it was lifted from a straight-to-DVD movie about talking puppies, encourage the home audience to “grab a pencil and a piece of paper” because “teacher, teacher, now we’re back in school.” It’s like that nightmare where you’re taking your final exam and you haven’t attended class all semester, in song form. The theme for GSN’s revival of the word-association game Chain Reaction has the most literal lyrics of any song on this list: A woman essentially talk-sings the rules of the game as a sample round unfolds on screen. “It starts with ‘word,’” she begins, “There’s a ‘G’ underneath / Guess the word ‘game,’ and you’re right / The word ‘game’ starts the chain.” And so on. Although it seems dull in text form, the lyrical crash course is set to a nice syncopated rhythm that echoes the stop-and-go pace of exploration and epiphany in the game itself. By briefing viewers on the rules, the theme also lessened the load on first-time game show host Dylan Lane, who could then launch into the day’s game with minimal prelude.